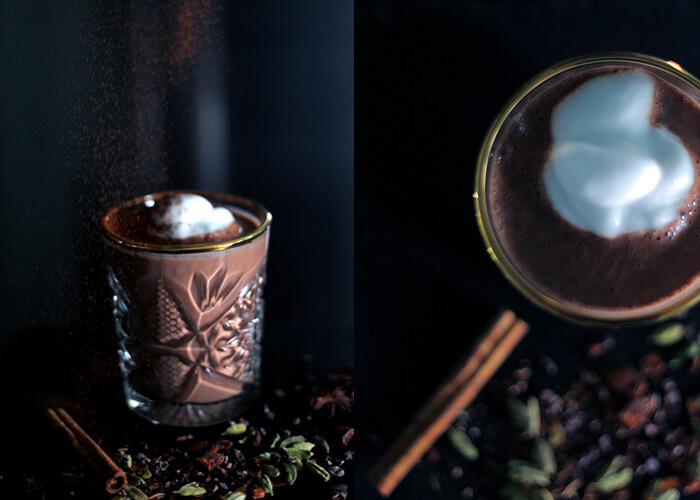 Vegan hot chocolate, smoothie style. As someone who loves smoothies, but also as someone whose lips and fingers turn purple of eating smoothiebowls in winter, I decided to create a winter-friendly recipe that will bring you in the Holiday mood in no time. 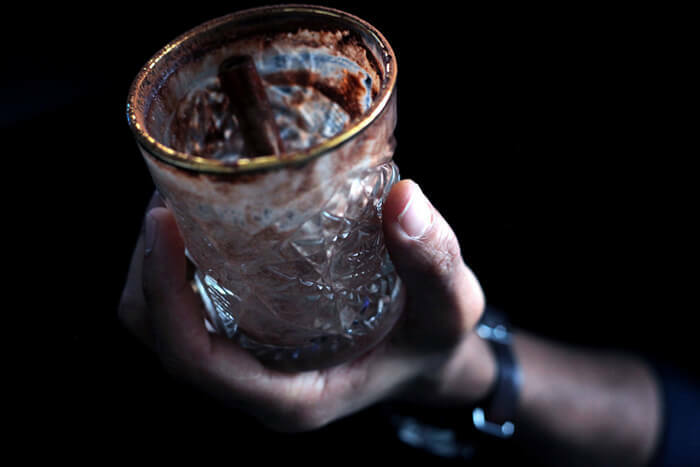 The recipe is simple, nutritious and tastes like an adult version of a Snickers bar. It’s high in magnesium, contains plant protein, good carbs and fiber. The spices stimulate your metabolism and blood flow. So yes, this recipe is not only a great after-outdoors-workout-snack, but is also a wonderful breakfast in bed option. 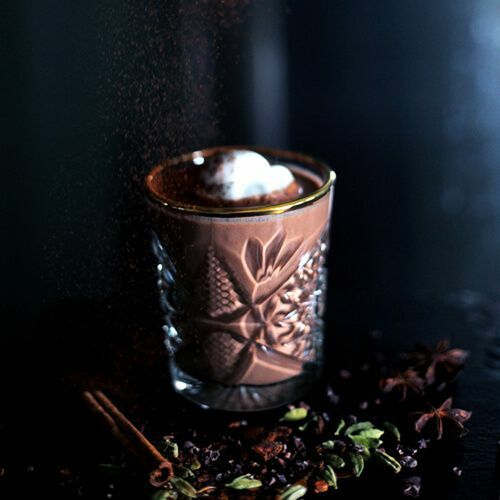 Pick a chilly Sunday morning, put up some old crackling vinyl records and spoil your loved one with a good glass of Spiced Hot Snickers Smoothie. Warm up the almond milk. If you have a milk frother, you can top it off with foam and more spices. After a 5-day Tuscany trip with lots of sightseeing, an intense bike tour and gorgeous Tuscan meals, we’re back to the comfort of our own home and our own kitchen. 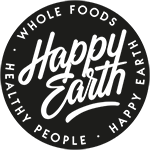 Although the food I enjoyed was good, fresh and vegan with lots of raw fruits and veggies, there was also room for indulging in artisan bread, fresh pasta, an occasional wine and even vegan chocolate gelato (who could say no to that). I figured I could give my digestive system a rest and replenish my body with micronutrients to counter the effects of some of the inflammatory foods of the past days. 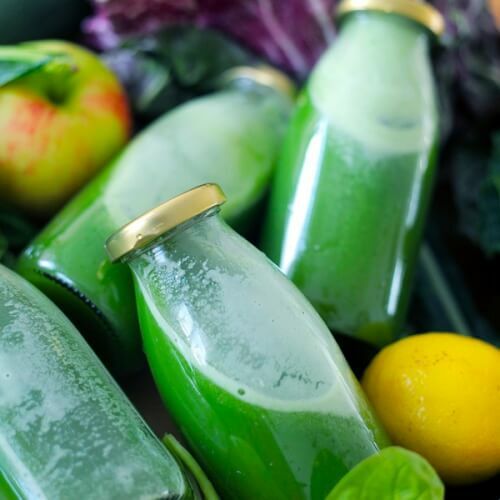 So this morning I made a big batch of my alkalizing green super juice, divided them into smaller portions and popped a week worth of morning juice in the freezer. 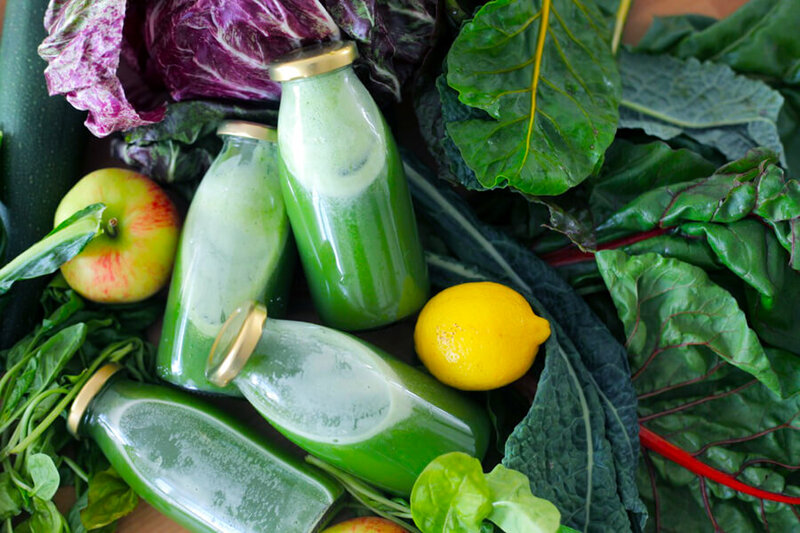 Green juices in the morning are a great way to get your vitamins, minerals, antioxidants, phytochemicals and enzymes in. Since the fiber is removed, it will go straight to your system without having to be broken down and without requiring energy for digestion. This will rejuvenate and energize you. The alkalizing, anti-inflammatory and detoxing properties of the ingredients will clean out and balance your body and boost your immunity. So the next couple of days I will start my day with this elixir. The only thing I have to remember is to get a bottle out of the freezer before going to bed and then mix it with some fresh coconut water in the morning. 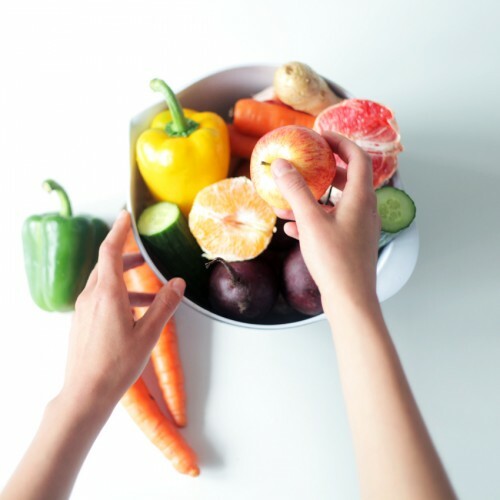 Run all the fruits and vegetables through a juicer and top it off with some fresh coconut water or ice cubes. In order to prevent bad digestion and to promote the absorption of nutrients, we should take plenty of time to chew our foods. But sometimes we are in a hurry, are impatient or just a bit lazy. At those moments we can help nature a little by mechanically breaking down food with the use of a blender. 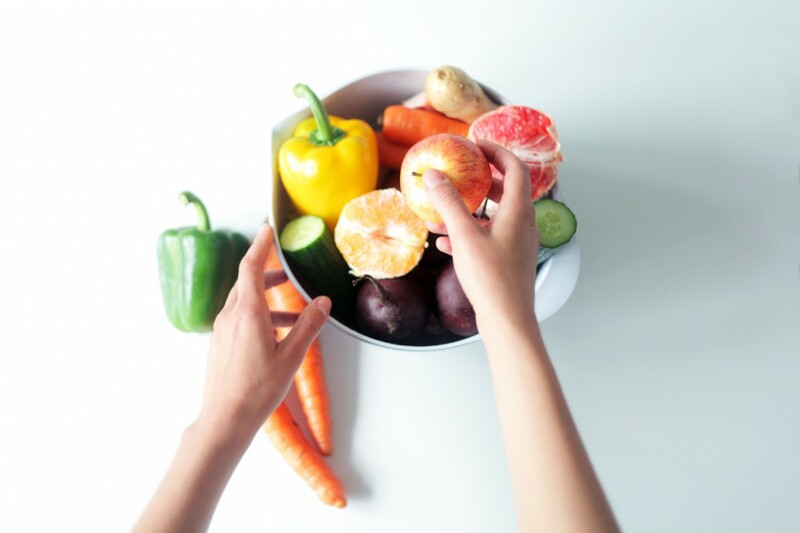 Blending makes the absorption of foods easier and (as opposed to cooking) maintains living enzymes, which are essential to digestion and cellular health. Add picking and combining foods that have the most positive impact on your gut and and you’re just one step away from boosting metabolism, working toward less bloat, and having a flat(ter) belly. 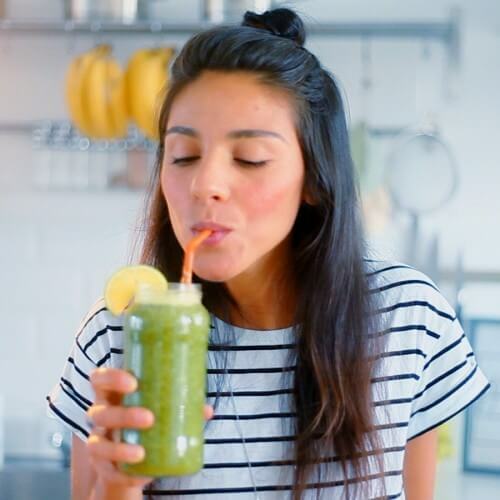 Raw fruits and vegetables are packed with fiber, micronutrients and living enzymes, so you can’t really go wrong with a smoothie. However, there are some important details to know and some key ingredients to consider. In the end it’s all about single-mindedly creating the ultimate elixer. Let me share my bloat beating, digestion promoting formula with you! Papaya, Pineapple and Mango contain digestive enzymes. Moreover papaya has a strong capacity to destroy intestinal worms (eeks! ), especially the seeds, so do include a bit of the seeds in your smoothie. Young coconut meat has a jelly-like texture and is the most nutritious form of coconut. In the Netherlands it is sold frozen at Asian supermarkets. Young coconut meat feeds the good bacteria in the intestines and helps regulating digestion. It contains Lauric Acid, which our body converts into Monolaurin (coconut being the richest source after breast milk). Monolaurin kills disease causing bacteria, virus and fungi and intestinal parasites. If getting hold of young coconut meat is difficult, go for coconut water instead. For proper bowel function (whether it’s constipation or diarrhea) bananas and mangoes are an excellent choice because of their high content of fiber and electrolytes. Furthermore, bananas & mangoes have prebiotic properties, which help the growth of good bacteria in the guts. Makes sure the bananas are ripe, for they will digest easier, contain higher levels of anti oxidants and as they’re fully ripened will produce TNF, a substance that has anti-cancer qualities. Knowing what you should eat is as important as knowing what you should avoid. To be blunt we could say that a super healthy habit makes little sense if you’re living on junk the rest of the day. Anyone who cares for their health or experiences digestive problems like constipation, diarrhea, bloat, gas or cramps should pay attention to proper food combining and avoid (or at least drastically reduce their intake of) soy, dairy, gluten, alcohol, fatty foods like oil and meat, caffeine, soft drinks, refined sugar and artificial sweeteners. Watch video/and or get recipe below. You can just put all the ingredients in the blender and mix until smooth, or you can make the layered version as shown in the video. Layer 1: 1 banana, 1 cup pineapple, 1 cup young coconut flesh (along with the fluid). Blend until smooth and pour halfway up the glass. Layer 2: 1 banana, ½ a mango, ½ a papaya, bit of water if needed. Blend until smooth and top up the glass. Note: If you’re suffering from Fructose Intolerance I believe you can still benefit from this elixir. I suggest to just leave the mango out, since it’s on the high FODMAP list. Recommendation: If you want to learn more about digestive health I recommend the book Gutbliss, an insightful, practical and easy to read roadmap to good gastrointestinal health by integrative gastroenterologist Dr. Robynne Chutkan. Sometimes I want to make myself a quick and easy green juice, but then I start overthinking and complicating things. Especially when it’s the end of the week, I think about my empty fridge and about what the perfect combinations were again. I decide doing a hit and run to the grocery store, but then I feel too busy, too lazy or I have some other kind of excuse. And when I finally start juicing with leftover veggies, I always end up throwing some carrots or beets in, because they happen to lie around there anyway. And then I realize I was supposed to make myself a green juice, so I look up some recipes online while sipping on my orange/brownish creation, promising myself to remember this wonderful 7-ingredient recipe I just came across for the next time. And as you may guess, by the time next time arrives, I either have forgotten about the recipe, or I am out of ingredients and then the whole thing starts over again. If you don’t have a juicer, you can use a blender and make green smoothies instead. Just ad a cup of water to the recipe and you’re good to go! With Love From The Happy Earth Kitchen. If you’re on a plant based diet trying to get your iron levels right, eating iron rich sources may not be enough. The amount of iron absorbed from plant foods depend on the other types of foods eaten at the same meal. Some foods aid in the absorption of iron, while others (like coffee, tea, legumes, milk and dairy products for example) can actually decrease the amount of plant based iron absorbed at a meal. When it comes to plant based iron, proper food combining is key. 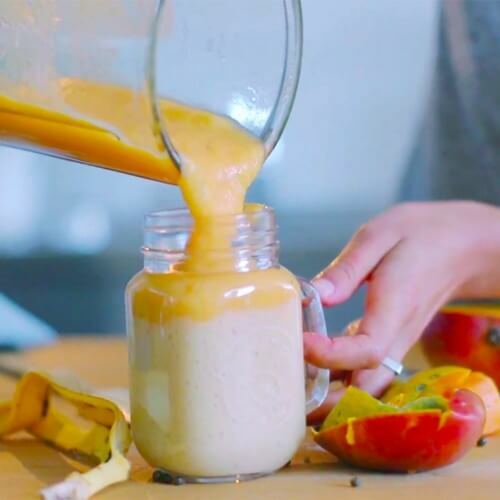 Watch the explanation & get the Iron Rich Breakfast Smoothie recipe from this video. 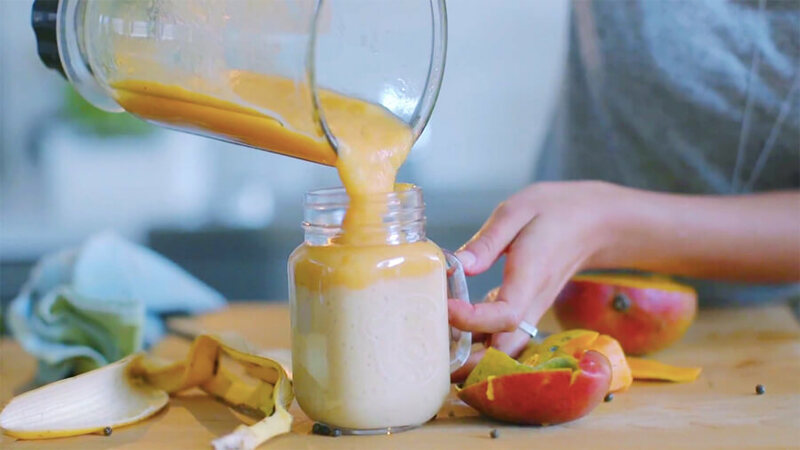 This smoothie hydrates & refreshes like (almost) nothing else. 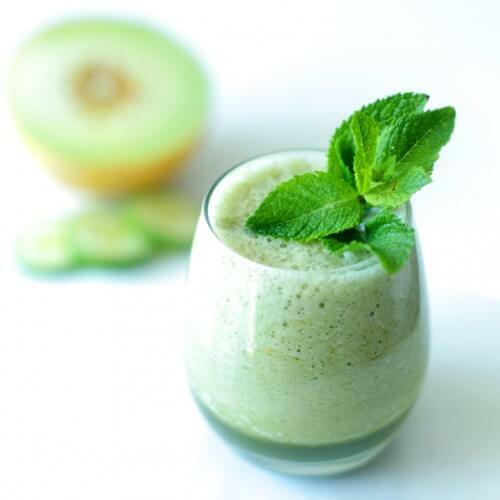 Its high water and high potassium containing ingredients make it an excellent drink on hot and sticky summer days or before or after working out. Honeydew, cucumber, mint and coconut water is all you need. If you don’t have any coconut water available, regular water is also fine, but the coconut water just perfections this smoothie. Here’s why. Coconut water is often described as nature’s sports drink, and not for nothing. It is a natural source of electrolytes, containing 5 key ones of them: sodium, potassium, calcium, magnesium, and phosphorus. Because electrolytes are lost through sweat, replenishing your body on hot days or after physical exertion is important. The carbohydrates in fruit break down into simple sugars (fructose) in the body and provide you with instant energy. The honeydew’s high water and potassium content is effective at maintaining healthy blood pressure levels, while the copper content supports your body’s ability to repair its muscles and tissues. Just what your body might need during exercise. Cucumber is a family of the melon and like melon, great for (re)hydration, due to its high water content. Moreover, one cup of cucumber provides 11% of your daily needs of Vitamin K, important for improving calcium absorption, which is essential for optimal bone health. For me the pleasant scent of peppermint works as an energizer. It refreshes and cools down the body. As a bonus mint has painkilling and anti-inflammatory effects, very useful for performance, exercise and recovery. If you’re having this smoothie as a workout snack, drink it 30-60 minutes prior to your workout, or within 30 minutes after your workout. After you’ve pushed yourself, your body is too tired to work at heavy digestion, so keeping it light within that timeframe is ideal. If you want to make this your main post-workout meal, I would say, double the size and feel free to add some protein in the form of hempseeds / hemp protein or coconutmilk, some ground flaxseed and drink it within 60 minutes after working out. 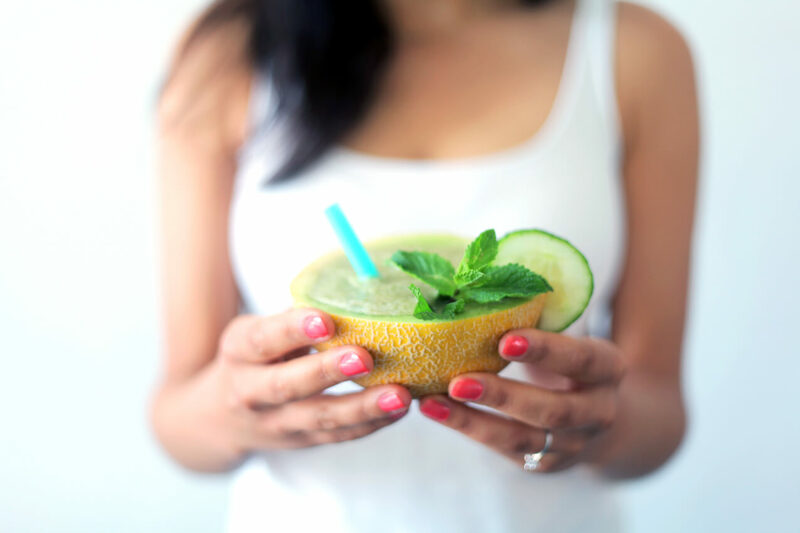 The perfect way to serve this smoothie is in a honeydew bowl of course. 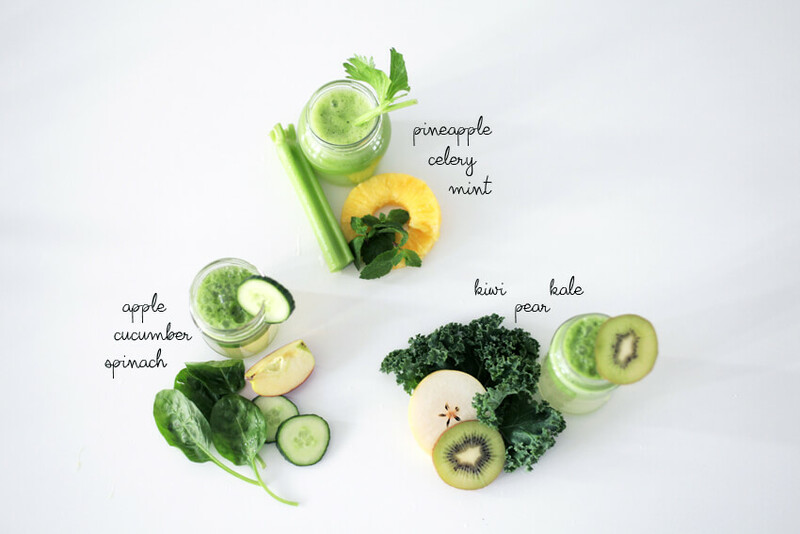 Blend until smooth and serve in a glass or in a honeydew bowl. I call this the ‘whatever is in your fridge’ aka ‘Everything Juice’. 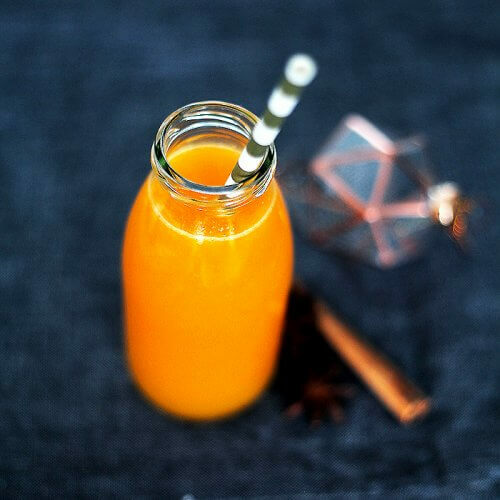 Whether your goal is to get a high dose of mixed nutrients in or saving your fruits and veggies from ending up in the trash, this juice is an awesome, healthy and smart solution. 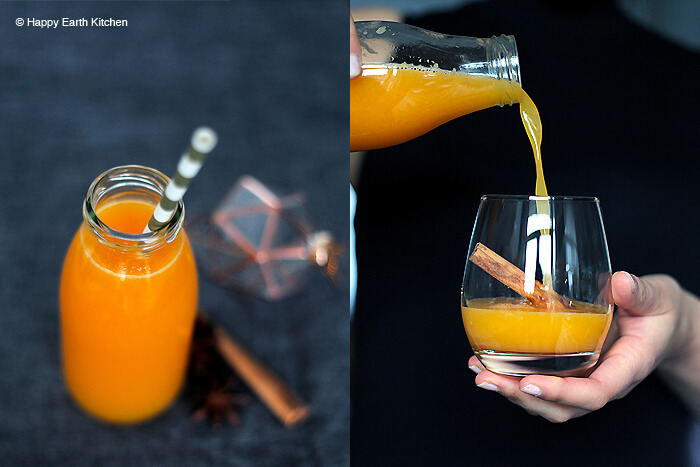 Basically you can use anything available in season or in your pantry, but make sure the main ingredient is something you truly enjoy, for most people that can be apples, oranges or carrots (for they have a slightly sweet taste and are high water content, ideal for juicing). If there are any fruits and veggies you don’t like, feel free to leave them out or replace them with something else. I want your juice to be enjoyable, not something you feel forced to drink for health reasons. Mix it up, use what ever is in your pantry. I prefer to juice in bigger batches, because cleaning the juicer can be a pain in the neck. I divide the juice in portions and store them in the freezer. This way the nutrients are not lost and I can get my morning fix without the drama of peeling, cutting, juicing and cleaning. All you have to do is remembering to get one out of the freezer before going to bed. 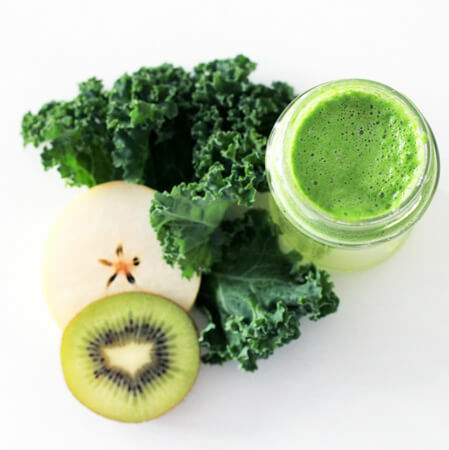 To supercharge this juice, add a teaspoon wheatgrass powder to your serving. If you don’t have any wheatgrass powder and aren’t planning to buy any, adding some dark leafy greens to the recipe is also an option. Anyway, I promise you that your energy levels will thank you after kicking off your day with this a juice like this!